In a passenger terminal, place a lot of toilet stalls . now save the game. Demolish all the toilets , your cash goes up .Now save the game And then reload. Have the game patched to the latest version. 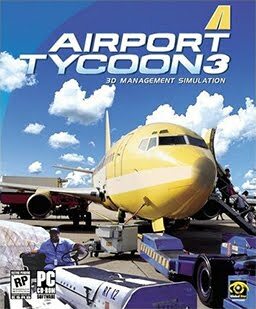 Use a text editor to edit the "airlines"
file in the "\program files\global star software\airport tycoon 3\data\db" directory. Set the value for the "QUALITY" line to "1". All airlines will now be unlocked. Have the game patched to the latest version. Use a text editor to edit the "planes"
Change the date value of each airplane to "1/1970". Have the game patched to the latest version. Use a text editor to edit the "buildings"
Change the date value after the "destroy" line of each building to "1/1970". Change the value before the word "BUILD" in each line to "0". Also, change the value after the word "MONTHLYCOST" to "0". all the toilets . Your money will increase. Save the game again. Load the saved game.